let me just start this post by saying that i totally missed the memo about easter coming up. i think it is celebrated in korea, but it is not 1/4 of the occasion that it is in the states. i felt like a total idiot - who misses something like that? i do blame part of it on the fact that we're still experiencing winter here...so my brain hasn't kicked into spring-mode yet! last night i started taking korean lessons. woohoo! there is a KNU alum/current employee who is giving FREE lessons to our new group of teachers. the last time he charged 100,000 won per person (maybe around $90 USD) but he decided to absolutely bless us with FREE this time around. his english name is hank and he is going to work us hard. we are only able to meet for an hour and a half each week so we will cover ALOT of ground each class. he will allow us to speak korean only during classtime - no english! and he expects our full dedication. if there is ever a time when attendance dwindles below 50%, he will start charging us for the lessons. and if we absolutely HAVE to miss a class for some reason, he will only excuse it if we send him a text message in full korean with a really good excuse. last night was just orientation, but between now and next week, we have to get the book and be squared away on the first 60 pages! we're talking slave-driver here. but it's absolutely what i need! i have definitely stagnated on my korean studies the past few weeks, so now's the time to get it into gear. i hope i can learn alot these next couple of months...it will involve ALOT of serious studying, but this is too great of an opportunity to pass up! i mentioned before that healthcare is really inexpensive here. same goes for eyewear. my dear friend soo-in helped me get some new specs this week. the eye dr actually laughed at me during the exam - i think partially because i couldn't speak korean, partially because she was absolutely amazed at how terrible my eyesight is. everyone thinks i am way younger than my 24 (korean) years, so they couldn't believe that such a young "kid" could be so blind. because my prescription is so high and my lenses are so thick, my glasses are much more expensive than the average joe's. and by that, i mean i paid 80,000 won - or around $70 USD. hahaha. they're super quality and fit great. i got a really cheap pair in america right before i came to korea - i mean, really...a piece of crap. and they cost me over $100! one more reason to love korea. 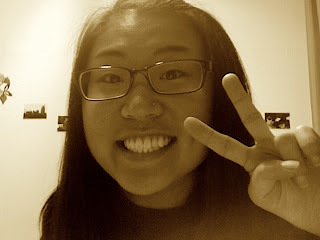 here i am looking super asian with my new glasses and a peace sign on my face: these came at just the right time because the yellow dust has really been irritating my allergies and making it difficult to wear my contacts all the time. my eyes get really itchy and watery sometimes, so i needed a good pair of glasses to wear on the bad days. check! i was able to catch up with a friend of mine from TESOL this week. we haven't seen each other since classes ended back in february, so it was wonderful to share a cup of tea together and swap teaching stories. so-ra teaches at a hogwan (private institution) in the evenings. she says that she has to be a mean teacher, but look at this face...could you imagine her hurting a fly?! ok, maybe that crazy photobooth picture isn't the best indicator. but trust me - she's the sweetest! she said she will be moving soon (still nearby), but once she gets settled, she wants me to come over for dinner and tea. wonderful! did i mention that i am teaching an english class FOR teachers? we meet every other week and i teach the 2-hr long class...bleck! talk about intimidating...i'd take kiddies over teachers anyday. i was seriously dreading this class forever, but lo and behold - it's become something WONDERFUL! we have about 7 or 8 regulars and they are the sweetest, most willing students ever. they are so kind and complimentary to a rookie like me, and genuinely interested in what they can learn from me. it's still really weird filling this role of "teacher" but i am learning to really, really love it. i am anxious to see how this class develops. 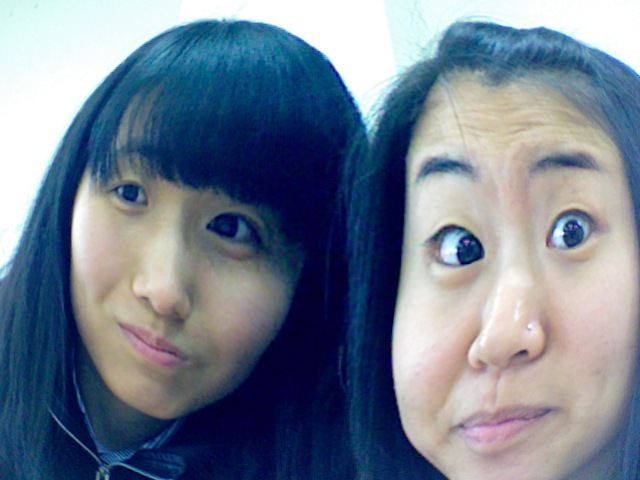 this wednesday, i taught on cultural differences between korea & america - that was a really long PPT! hahaha. but we had so much fun together and they are really willing to open up and talk freely in english...such a blessing! most koreans are so shy to use their english...i am infinitely grateful when i meet one who is willing to make mistakes and not run away in embarrassment. and now i have a whole class of them! speaking of teaching, i'll go ahead and admit that my 5th & 6th graders have got me wrapped around their little fingers. i really do think that i have the best students ever. it makes my day to see them every morning...they are always so excited to run up to me and yell - HELLO TEACHER! i will have to get some pictures of them soon so you can see what i get to deal with everyday...i don't understand how i get this opportunity AND get paid for it! i had a really funny experience with one of my 5th graders this week. she came up to me and said "hello teacher! how are you?" i replied: "i'm really well, thanks! how about you? and don't answer 'fine, thank you.' think of something else" ("fine, thank you" is the standard answer taught in schools here. i discourage it so students actually know what they're saying. i keep asking until i get a "good/bad/so-so/tired" so i know that they understand what they are telling me.) the 5th grader thought for a second and answered: "i'm a tiger!" i just looked at her with this really strange look and said - "a tiger?" and then she died laughing. i found out later that she was trying to tell me that she was tired. close...but not quite. i have to utilize public transportation daily here. it's totally different because back in the states, i just cruised town in my little car. ohio isn't necessarily known for it's great public transportation system. anyways, korea is a really busy place. everyone is busy and has places to go, people to see. there's no time for chit-chat. and the commute is almost like breaktime - a time to just be quiet and relax for a second. (not to say it's relaxing to ride a city bus - more on that another time. these drivers are crazy!) koreans, especially the older ones, really like the subway car or bus to stay pretty quiet. and most of the older ones kind of hate english, too, so it's especially recommended to stay pretty quiet. i learned this pretty quickly when i kept getting dirty looks from the ahjummas & ahjussis. they are more tolerant of white people talking loudly in english, because they just write them off as ignorant waygookin (foreigners). but i have learned the hard way that they do NOT like it when a korean is disturbing the peace by speaking english. i go back and forth between letting this bothering me and just dealing with it. part of me says "i'm just as american as my white friends," but the other part of me thinks, "true, but it's just confusing to people who don't know you." this is a small thing, but part of what i experience daily. i definitely have things to think about that the other native english teachers do not have to. my korean face makes it easier to offend or anger someone unintentionally, who doesn't know to give me the waygookin grace. just a day in the life!